Thanksgiving Leftover Recipes : Cooking Channel. Well, it never hurts to have a few things in mind when you are faced with a refrigerator full of leftover items and not sure what to do with any of it. Cooking Channel has assembled several great recipes here to give you some great ideas of things to do with turkey, your side dishes and even the leftover pie. Check it out! Last-Minute Thanksgiving Dishes | Williams-Sonoma Taste. More last minute Thanksgiving dish ideas from Williams-Sonoma to make use of things you may already have in the house but aren’t sure what to do with or you need that sudden dish to bring somewhere. Give a look and see what you can do. Check it out! Last Minute Thanksgiving Recipes – Photo Gallery | SAVEUR. If it’s getting down to the wire and you are hosting Thanksgiving dinner, there is still time for you to get some ideas for quick and easy items for you to make. Saveur Magazine has put together 38 recipes for you to make things last minute that taste great. Check it out! Thanksgiving Dessert Recipes – CHOW. CHOW has some wonderful ideas for your Thanksgiving Day dessert table. If you are looking to do something a little different than the usual pumpkin pie or apple pie, check out these suggestions and give one a try this year! 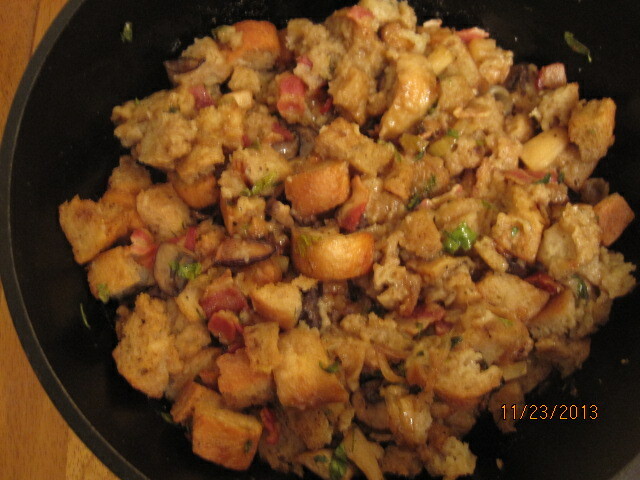 When I made the simple roast turkey the other day, I also wanted to make a very simple stuffing to go along with it. I wanted something that didn’t use a lot of ingredients and would use what I most often have on hand in the house so I could be sure to whip it up with ease. Luckily, in the same New York Times article that I found the turkey recipe I also came across this stuffing recipe and it was perfect for what I had on hand. Not a lot of fuss, ingredients or anything else. The only change I made to it myself to make things easier is that the recipes calls for leeks, which I did not have on hand. I substituted an onion instead, and I think the results were just fine. Heat the oven to 250 degrees. Butter a 9 x 13-inch baking pan. Trim the crusts from the white bread and cut it into 1-inch cubes; if you are using corn bread, coarsely crumble it. Spread the bread pieces out on one or 2 large baking sheets. Toast in the oven, tossing occasionally, until the bread crumbs are very dry, about 30 minutes for white bread, about 1 hour for the corn bread. Transfer the crumbs to a large bowl to cool. Increase the oven temperature to 375 degrees. In a large skillet over medium-high heat, cook the bacon strips until they are crisp. Transfer the bacon to a paper towel-lined plate to drain, leaving the fat in the pan. Add the leeks (or onions) to the bacon fat and cook, stirring occasionally, until they are soft, about 5 to 10 minutes. Add the mushrooms, 1 teaspoon of kosher salt and 1.2 teaspoon of black pepper. Cook, tossing frequently, until the mushrooms are tender and most of their juices have evaporated, about 10 to 15 minutes. Stir in the sage and cook for 1 minute. Add the wine and cook until it evaporates, about 2 minutes. Spoon the mushroom mixture over the dried bread. Stir in the chicken stock. If you are using white bread, stir in the cider. Add the parsley, 1/2 teaspoon of kosher salt and 1/4 teaspoon of pepper. The mixture should be moist and very soft. If you like your stuffing extremely moist, add enough stock to make it seem slightly soggy but not wet (Think that it should look like pudding). Crumble the bacon and stir it into the mixture. Transfer the bread mixture to the prepared baking pan. Drizzle 3 tablespoons of melted butter over the stuffing. Bake until the stuffing is golden, about 35 to 45 minutes and serve. I did make one other change to this stuffing. I did add in one diced apple to give it a little extra crunch and flavor. Michelle said it seemed like just what the dish needed and she really enjoyed it with the apple in it, but make your own call if you like that kind of stuffing. The great thing about this dish is that it was easy to do. If you make the bread crumbs ahead of time (the day before), you can throw this together and put it in the oven while your turkey is resting and it should be done in plenty of time. I think this stuffing would go well with your regular weeknight roast chicken as well if you wanted to make your weeknight meal a little fancier or just feel like having some stuffing. That’s all I have for today. Check back next time for more recipes. I will be making a post tomorrow, most likely with links to some other websites that have Thanksgiving meal hints and recipes. I will have a post in the coming days as well as you try to make use of some of your leftovers. I think I have some easy ideas of things you can do. Until next time, enjoy the rest of your day (if you are on the East Coast, you are getting pelted with rain, like we are) and enjoy your meal! Let me preface this post by saying I do not like macaroni and cheese. I don’t eat pasta, I don’t eat cheese, so this dish really does nothing for me personally. That being said, it’s always a great idea to have something on the table that you know little ones are going to eat up, and macaroni and cheese always seems to be one of those dishes no matter what the occasion. Why not give the kids something special and offer this one up for them? Also, most adults I know love the stuff as well, so the big batch that this recipe makes might actually be just the answer you need for everyone and you may not even have that much left. According to Alton Brown, this is the most downloaded recipe of all-time at Food Network, so we had to give it a try to see what it was all about. Heat the oven to 350 degrees. For the pasta, In a 4-quart pot, cover the macaroni and salt with 1 inch of cold water. Bring the water to a boil over medium heat. When the pasta comes to a boil, begin testing it for doneness. Cook the pasta until it is al dente. Drain the pasta in a colander and rinse it with cold water to stop the cooking. For the cheese sauce, while the pasta is cooking, melt the butter over medium heat in a large saucepan. Once the butter stops bubbling, whisk in the flour and cook until the mixture is pale blonde, stirring occasionally, about 3 minutes. Add the mustard, paprika, onion and bay leaf and whisk to combine. Add the milk, whisking continually for 7 to 8 minutes or until the mixture is slightly thickened. Remove the saucepan from the heat and discard the bay leaf. In a small bowl, lightly beat the egg. Add a few ounces of the milk mixture to the egg and whisk it to combine. Add another few ounces of the milk mixture to the egg and thoroughly combine. Then add the egg mixture back to the milk mixture and whisk vigorously. Stir in 3/4 of the cheese and season well with salt and pepper. 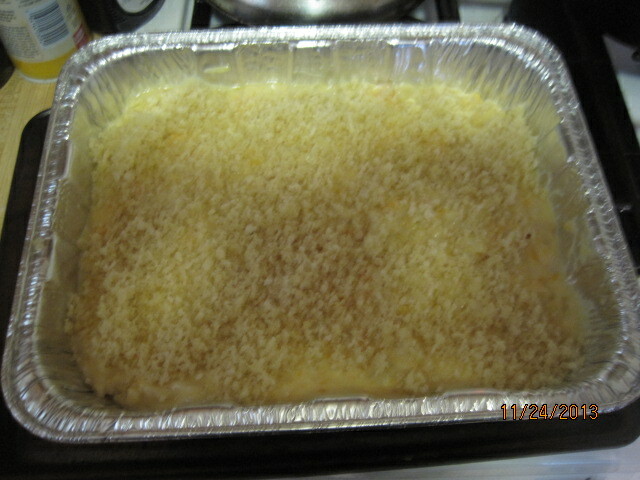 Fold the macaroni into the mix and pour it into a 4-quart casserole dish. Top the macaroni with the remaining cheese. Toss the breadcrumbs with the melted to butter to coat the crumbs. 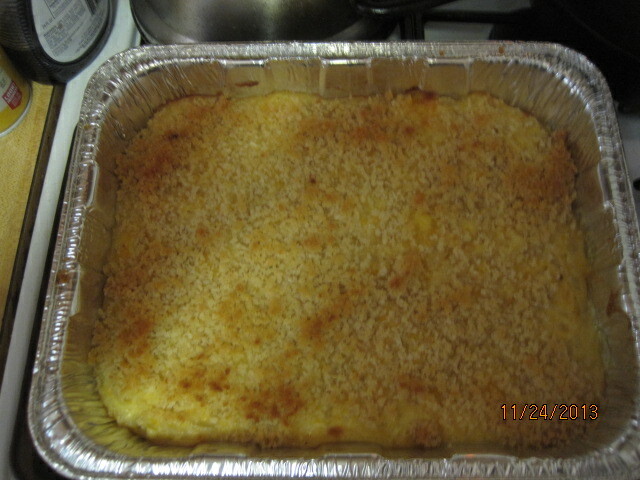 Sprinkle the macaroni with the breadcrumb mixture in an even layer. Bake the macaroni and cheese for 30 minutes. Remove it from the oven and allow it to rest for 5 minutes before serving. As I said, I don’t like it, so I didn’t try it. 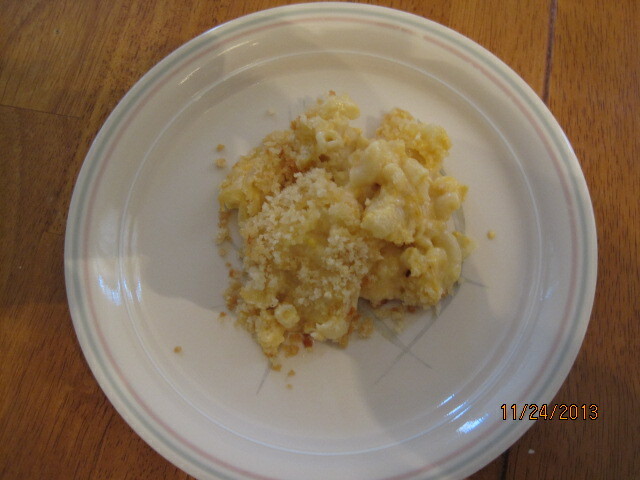 That task was left to my macaroni and cheese experts, Michelle and Sean, who both adore the meal. They both liked the added texture you got from the breadcrumbs and both really enjoyed the cheese sauce. Their only critique is that they felt the onion was a little too overpowering in the dish. I think for the next go round on this one, we’ll be leaving the onion out of the equation all together. If you like the flavor yourself, and I am sure many people do, by all means leave it in. I think it’s a great idea to have this on your Thanksgiving menu so it gives something a little different to eat for everyone and maybe appeals to the finicky kids who may not eat anything else. It’s certainly worth a try. That’s all I have for today. Check back next time for some more recipes. I do have one more stuffing recipe to share and then some ideas for leftovers, including a turkey pot pie and some turkey soup. I already made about 12 cups of stock from the turkeys I have used over the past week or so, so there are plenty of soup options. Until next time, enjoy the rest of your day and enjoy your meal!